In 2017, The Community Foundation awarded a grant of $50,000 to Greater Muncie Habitat for Humanity. 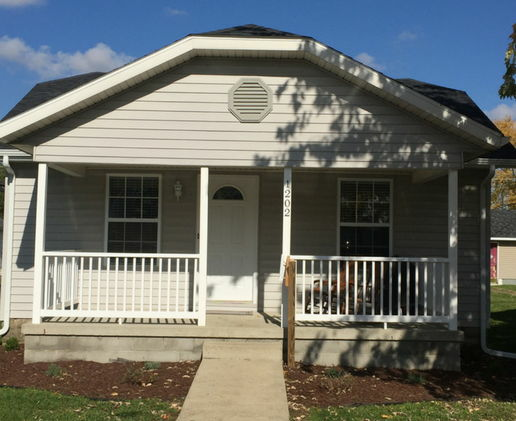 Our grant supported Habitat’s 2017 Housing Program, which served 25 families, including three new construction projects, two rehabs, and 20 home repair projects. The three new construction projects and two rehabbed houses provided new homeownership opportunities for five families in our community. Over the last year, these families partnered with Habitat for Humanity to complete education classes, save for a down payment and put in sweat equity hours working on their homes. Families who purchase a home with Habitat for Humanity see improved living conditions, reduced housing costs, and they begin to accumulate assets as they pay down their mortgage. This was recently true for Debbie Boyd, who became a homeowner this year. Debbie, who lives on a fixed disability income, was paying $640 a month to rent an apartment in Muncie. She purchased a rehabilitated home with Habitat for Humanity and her mortgage is now $272 each month, including taxes and insurance. Debbie loves her new home and feels that she finally has some breathing room with her finances. The Community Foundation is pleased to have been a part of a program that helped people in our community obtain and maintain safe and affordable housing options. Projects, like this one, are funded through grants made through unrestricted funds at the Foundation.